Attention strawberry lovers. A Very pretty shaker set from McCoy’s Strawberry Country dinnerware line!decorated with bright red strawberries, vines and blossoms. 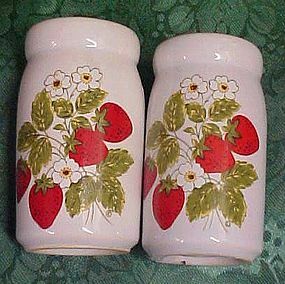 Shakers measure 3 ¾” tall and are in excellent condition. Original plastic stoppers are intact. I will be listing other strawberry items.